Soft Enamel Trading Pins are the most popular pin style at any tournament. 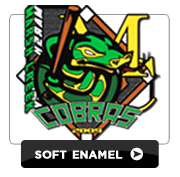 The manufacturing process known as Soft Enamel produces the most desirable, highest perceived value Custom Trading Pins. Soft Enamel Trading Pins start life from the creation of your design. Your Soft Enamel Pins can be made from any shape and size. Once you approve your design, we send a working drawing to the factory for manufacture. This process takes about 10 days and starts with the creation of a mold that is the same shape as your Trading Pin artwork. From the mold, we stamp out your pins from raw metal material, which is a copper and bronze mix. The stamping process creates raised and recessed areas along the pins face (very similar to a coin) that you can feel with your fingers. 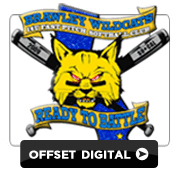 After your pins are stamped from the mold and checked for accuracy, the colors from your approved artwork are individually filled by hand into the recessed areas with a very strong Enamel Paint. Your pins are then fired at 450°F for about 15 minutes. Then based upon your order request, a NO CHARGE optional epoxy protective coating (dome) will be applied to protect the enamels from fading or cracking. Next, the pins are hand polished and then plated with either 18K Gold, Silver, Nickel, Black Nickel, or several variations of Antique Finishes. Finally, each pin is inspected for quality and delivered directly to your home, tournament site or hotel. Click Here to view some of our Soft Enamel Trading Pin designs. Click here to begin your free quote! Our trading pins come in various options that you can choose from. Please refer to the tables below to get more information about each option. And remember if you have any questions, please call 877-503-0256. Or send us an email at sales@baseball-tradingpins.com. Danglers are used to designate special interest in your tournament, like the year of the tournament, a ball, a glove, your state, your flag, the American flag, and many other possibilities. Most common danglers designate the year of the tournament. Example: teams can use the same pin design year after year and we can update the dangler each year to represent the current tournament. Sliders are eye appealing and give a sense of action to the pin. Common sliders include; players running a baseline, swinging bats and moving balls. Sliders require a "slot" to be cut into the die of the main pin, then the slider pin, which is a trading pin itself, will fit into the slot of the main pin. Good choice for baseball / softball teams! This type of custom baseball trading pin can add extreme value, trading power and dimension to your custom trading pin. They attach on top of the pin face and can be spun with your finger above the face of the main pin. Popular choice for high-school sporting teams! These custom trading pins have battery powered, colored lights that blink when turned on. Blinkers add a high degree of "action" to your custom trading pin. They are typically used as eyes of a mascot on the pin, but can be used for many different and exciting options of your custom trading pin design. Great choice for animal inspired team names! This type of custom trading pin includes Glitter coloring. Glitter colors are very popular and add great dimension and sparkle. Glitter is an inexpensive way to make an extremely sought after, highly visible and expensive looking custom trading pin. Glitter enamel is added to the colors of your custom trading pin design to provide the desired effect. Great for softball teams, and cheer squads! 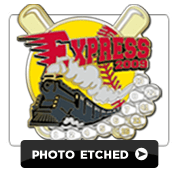 This type of custom trading pin will "bobble" when the pin is moved creating an eye catching effect that is different from any other type of custom trading pin. Bobble heads are typically the head of an official (umpire, ref, etc. ), the sports ball (softball, baseball, etc. ), or a player in your teams uniform. These custom trading pins are a great choice if your team has a unique personality and wants it to show through their pins! Very personal and can be humorous too!